Dark Night of the Scarecrow: Bubba Returns! I was standing in the lobby of the main hotel at FRIGHT NIGHT FILM FEST when a young man came up to me and asked if I was Dave from TERROR FROM BEYOND THE DAVES. Although I didn’t recognize him, it turned out that he and I had met before during a brief, but memorable, moment at Horrorhound Weekend last March. I remember at the time, the other Dave (David Albaugh) and I were standing in line to see Barbara Steele. Nobody likes being idle when there is so much to do around you, so we passed the time doing what we do best under these circumstances- staring at folks! Yes, both David and I consider ourselves to be avid “people watchers,” a skill that, no doubt, is something one the develops during an introverted, shy youth and gradually hones over time. While most people think the best subjects can be found at Walmart (as illustrated by the numerous viral emails that go around depicting the less refined members of their clientelle) it really doesn’t matter where you are nor the socio-ecominic satus of your subjects. The fact remains that we people, on the whole, are pretty darn funny! This irreverent art form can reach whole new levels of entertainment when performed at a horror convention. Where else can you see crowds of people intermingled with werewolves, zombies, your favorite 80’s slasher, or people casually walking around with an axe in their head while dragging their entrails behind? As we stood gazing in different directions, I suddenly spotted the ultimate fan costume – none other than “Bubba” Ritter from DARK NIGHT OF THE SCARECROW! Anybody that loves a good killer scarecrow movie should know two things; 1) DARK NIGHT OF THE SCARECROW was the very FIRST movie to feature one and 2) of the many killer scarecrow films and appearances to follow; there have been few as creepy as “Bubba.” Now, before my eyes, was a near perfect rendering of him casually walking past me at Horrorhound. I tossed David the camera and headed straight over to get a shot with him. Four months later, here he was again but, this time, without the costume and as his alter ego, Chuck Schauland. Chuck is younger than I am and first encountered DARK NIGHT OF THE SCARECROW during one of its cable airings – an avid fan ever since! Like myself, Chuck first met the film’s writer, J.D. 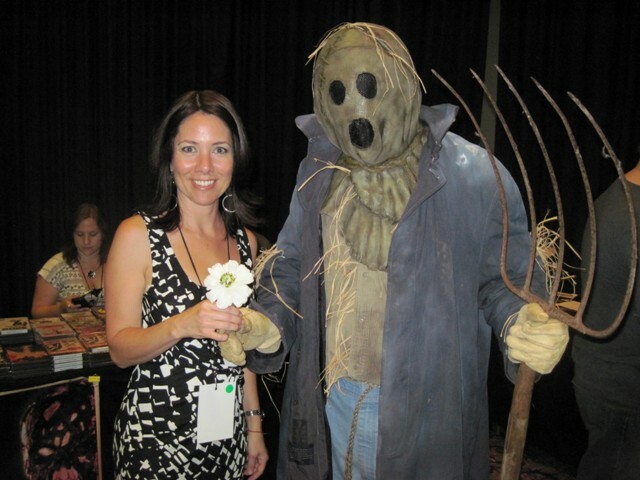 Feigelson, at the previous March Horrorhound in 2010. 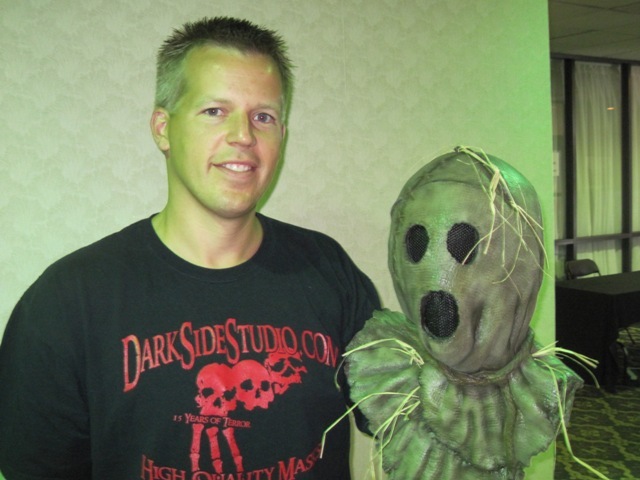 This would also be the year that the official “Bubba” DARK NIGHT OF THE SCARECROW mask created by Jeremy Bohr of “Featured Creatures would debut and Mr. Schauland has the distinction of owning mask #2 (the first belonging to Feigelson himself). Chuck Schauland with revved up Bubba Mask! I would end up seeing Chuck throughout FRIGHT NIGHT weekend. Usually he was donning his fantastic Bubba costume – made even more spectacular from adjustments Chuck made since March. 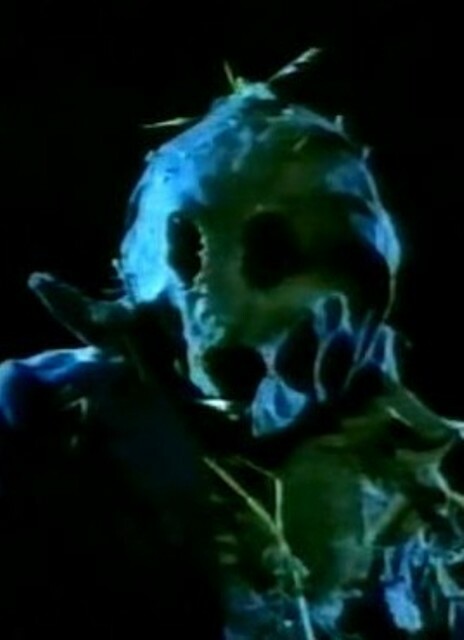 To say that he enhanced the DARK NIGHT OF THE SCARECROW reunion would be a terrible understatement. Despite the ferocious heat of that weekend, Chuck walked around in full regalia and even stood in the poorly ventilated main hall during the DARK NIGHT OF THE SCARECROW Q&A panel (to be covered soon). There is dedication to a movie…and there is Chuck! It is fans such as himself that really make events such as these more fun. I saw a lot of people stop and pose for pictures with him and everyone really loved a real life Bubba (complete with pitchfork this time) in action! Tonya Crowe never outgrew her childhood friend! As David Albaugh is the resident mask expert here at TERROR FROM BEYOND THE DAVES, Chuck was also helpful in assisting me in his absence – opening up a dialogue with a company we’ll hopefully have an opportunity to feature here soon; White Mask Productions (WMP).I really can’t say enough good things about him. He selflessly gave up a chunk of his own convention time to walk around (in a hot costume) and show other fans a good time. I’m so happy to have formally been able to meet him and hope he’ll stay in touch. 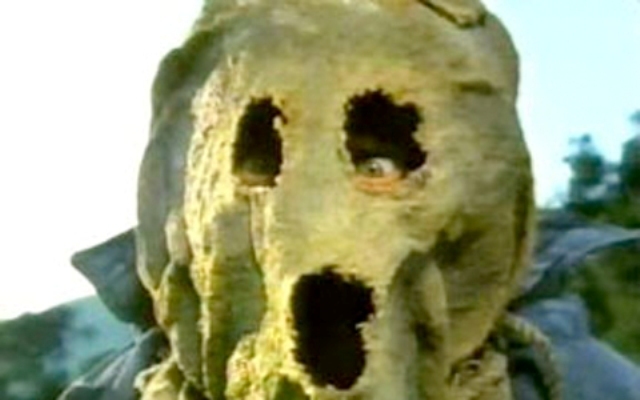 And speaking of masks, you should REALLY check out Chuck’s own blog; The Scarecrow’s Post! There you can find some incredible pictures of Chuck not only wearing his updated Bubba costume but also hanging out with the film’s stars at FRIGHT NIGHT. After you look at those, scroll back and check out his other mask photos which also include some pretty neat yard displays he created on his own property. I’ve learned a lot about masks and the mask industry via David Albaugh but Chuck’s more specialized taste in collecting (scarecrow and pumpkin-headed creatures) is something I can TOTALLY get in to. No wonder we’re both super fans of DARK NIGHT OF THE SCARECROW! NOTE: Please click on the picture below if you dare visit The Scarecrow’s Post!!! 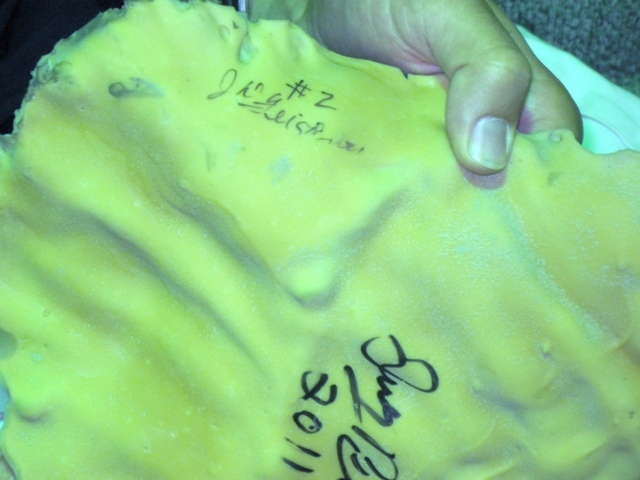 This entry was posted in Big 80's Horror!, Masks, Models, & Props! 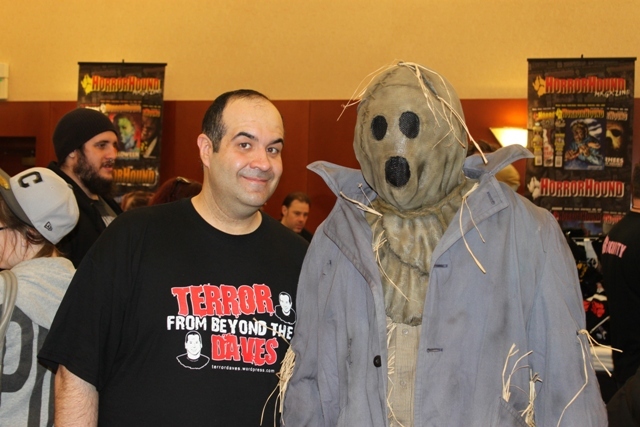 and tagged Bubba, Chuck Schauland, DARK NIGHT OF THE SCARECROW, FRIGHT NIGHT FILM FEST, Halloween Masks, Horrorhound, JD Feigelson, Killer Scarecrow, LARRY DRAKE, The Scarecrow's Post. Bookmark the permalink. ← “Dark Night of the Scarecrow’s” J.D. Feigelson at Horrorhound Weekend! Thanks Dave, I really appreciate the kind words!! Fright Fest was truly a blast and I was glad you and I got to hang out for a while amid all the convention commotion. If there is another Dark Night of the Scarecrow reunion it would be fun to be there with another Bubba aficionado again! Just read your article and interview in Famous Monsters of Filmland Magazine. I enjoyed it. I recall seeing that movie on TV in the early ’80s. It terrified me, but I loved it. Glad to know they have worked on the DVD. I just placed it in my Netflix queue. The reunion photos were really cool. Thanks Lisa! I think you meant “Scary Monsters Magazine” but, as it resembles the original “Famous Monsters” more than the actual one does these days. I can understand the mix up. I’m glad that you enjoyed the article and thank you so much for subscribing! Oh yes! Of course. I read both magazines today. Fun stuff.